The events witnessed and recorded in this report have precedent. The general area of Gila Bend, Arizona is known to be the source of unusual “lights” in the night sky over a period of many decades; casual research and investigation will verify that fact. There are also indications that Native Americans may have witnessed similar events over periods that span hundreds of years in the past, but I have no insight to verify this as of yet. Such eyewitness accounts are difficult to record because of the conditions of observation and the remoteness of the area. 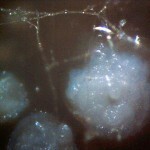 The account provided here appears to be unique in the level of detail that has been captured through careful observation and favorable camera work. It is of value to provide this information to the public record in demonstration that the accounts of sighting are credible, repeatable, verifiable, and of unique dimension and character. The essentials of location are shown in the map above. The point of observation is within the Sonoran Desert National Monument, approximately 30 miles southeast of Gila Bend, Arizona. The region is one of remoteness and lack of civilization. It is characterized by a vast expanse of desert, punctuated with several prominent mountain ranges within, including the Sand Tank Mountains as shown on the map. It is also important to note that west and southwest of the point of observation lies a significant military presence known as the Barry M. Goldwater Air Force Range. This area appears, not surprisingly, to host a series of advanced military interests, operations and technologies. The events shown here occurred on the night of January 27, 2016 at approximately 1930 (7:30 PM), about 45 minutes after sundown. There were two personal witnesses to all affairs described on this date, and they are each in agreement about the details that are presented. The evening skies were clear and without interruption. The camera used has a significant optical zoom (~30x) and it was able to consistently able to focus on the lights in detail because of their brilliance and size. The lights have a uniform and rich orange color, and they are quite distinctive from any common light source in the night skies, including that of aircraft. The pattern of appearance in the sky is instantaneous and without obvious or apparent motion. The lights appear sometimes singly, sometimes in unison, and sometimes in geometric formation. They appear at different altitudes, but they remain close to the horizon; in this case the light sources were never more than 5 degrees above the horizon and remained stationary during the periods of observation. 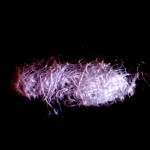 The lights, after an unpredictable period of time, vanish or extinguish themselves as if a fuel or energy source (e.g., ions, plasma) was exhausted. The lights have absolutely no rational similarity to the behavior of “flares”, as has been purported by certain individuals on the fringes of reason. The light and energy sources are truly unique, and the photographs here capture at least certain portions of that uniqueness that are not to be denied. The lights frequently remain visible for a period of several minutes in stationary form, extinguish themselves, and then reappear at a different location within the same general vicinity of the sky. The primary witness here has a strong background in the professions of surveying and photogrammetry. There is no inclination or predisposition to exaggerate any of the details of measurement or observation; all estimates originate from seeking the accuracy and error estimates that are characteristic of such work. The primary focus of this paper is the detail captured in the energy source that occurred closest to the point of observation, as shown within the map. It is the proximity of this light source to the observer and the camera that distinguish this record. The best estimate of the distance to this particular light source is between a range of five to ten miles. A small cinder cone three miles away on roughly the same line of site (approx. N80W) had been hiked to six days prior; this served as important reference point for distance. The Sand Tank Mountains behind the light source served equally well for reference points of both altitude and distance. The primary light sources shown here fall between these two reference points for distance. The primary light source shown here was both low to the ground and bright. The energy from the light was brilliant enough that ground level was partially illuminated. It was also apparent that this illumination extended equally in the opposite direction in all directions and upward into the night sky. There was certainly the sense of close proximity and direct experience within this event. It was of such immediacy that at one point the partner witness was asked what actions would be taken if it were to take shape directly overhead; there was no response to the question. Apparently captivation by the witness from the event was the priority at the moment. 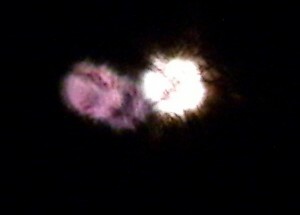 The primary light source remained visible for approximately 12 – 15 minutes. It remained stationary during that entire period. The brightness during this period did vary to some degree. The light source was repeatedly photographed with success, and only a portion of that image library is presented on this paper. A maximum of five lights were seen at one time; three in linear formation and a pair of lights at a separated distance. 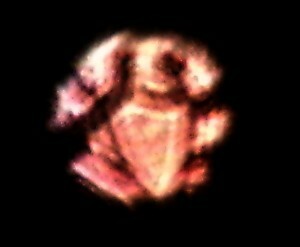 The images shown are the unique record from this event, and it is hoped that they will inspire the further investigations that they deserve. In total, the experience from various lights, in various locations and formations, of varying intensity but always stationary upon appearance, lasted close to an hour on this evening. There are some additional and ancillary details of this experience that bear mentioning. The first has to do with some “additional lights” that accompany the bright energy sources that have been photographed and shown here. 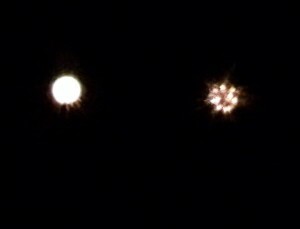 The best description that I can offer of these additional lights is that of “pinpoint fireworks”. These small lights repeatedly flash in random patterns in the general vicinity of the primary lights; in this case the majority of them occurred along the horizon to the west – southwest in the apparent vicinity of the Sand Tank Mountains. These lights do not show any linear motion or pattern characteristic of aircraft; they are numerous, of random pattern, momentary, and without any linear or obvious geometric motion. These lights appear to develop and become active in proportion to the intensity and number of primary light sources visible, i.e., they were at a maximum during the time of five primary lights being simultaneously visible. The role or source of these accompanying lights to the primary lights is in no way obvious. The secondary comment concerns the repetition of the events that are described above. These repetitions are now known to have spanned more than a month in time, and to have occurred in an additional location. The first incidence of repetition is in regard to the “additional lights” mentioned immediately prior. 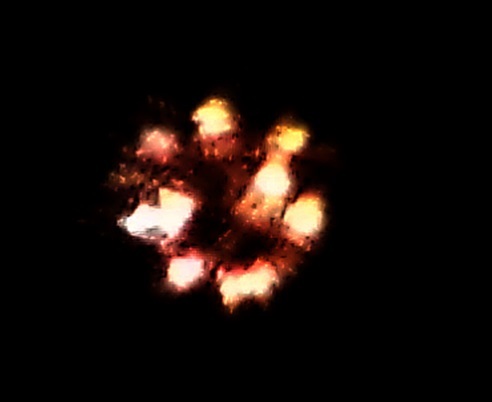 On the night of December 26, 2015 I also noticed an identical light pattern of “pinpoint fireworks” on the western horizon after dark from the same vantage point as that of December 27th, 2015. There were no “primary lights” witnessed on that same night. I mentally noted the observations as being unusual, but I dismissed the significance of the observations in “deference to conservatism”. I attempted to rationally attribute the unusual momentary light pulses to that of aircraft, even though the number of lights visible would defy any rationale interpretation, even in the presence of military training grounds in the remote desert. The events of December 27 now place that experience into the broader context of an extraordinary event that was to follow on the next evening. The next incidence of repetition occurs on the night of February 8th and 9th in a location known as Synder Hill, which lies in the fringe of the Tucson urban area, but nevertheless also under a darkened desert sky. The location is a curious blend of remoteness juxtaposed with urban sprawl and housing developments. It is a fair statement to say that the identical light patterns were observed again and it was only previous experience that confirmed their uniqueness amongst the urban impulses that dot the horizon and introduce chaos into the desert skies. The specifics of the case define this particular affair. The orange, stationary, appearing and disappearing lights appeared on the low horizon on an estimated bearing of N50W approximately 80 miles distant. It will be found that this matches the Gila Bend observation location as close as reasonable estimates will allow. It is only the previous experiences from two weeks prior that prompted the attention and details of observation. The evidence here is that the events are not singular in nature, and the history of record for the “Gila Bend lights” supports that claim. The estimated bearing is N70E. Estimated distance is approximately 80 miles (such estimates are not difficult with star navigation). It will be found that this location estimate leads to another point of interest, the White Sands Space Harbor. Suffice it to say that White Sands is another region of the country that is richly steeped in military history, including the detonation of the first atomic bomb (Trinity Site) and development of the U.S. space and missile programs. And finally, it should be mentioned that at the close of the Sonoran Desert National Monument event, the silhouette of two fighter jets circling almost directly overhead could be seen as they turned an arc from the observation site toward the southeast, apparently in return towards Davis Monthan Air Force base in Tucson, AZ. The aircraft appeared to be of the A-10 “Warthog” model, and what was noticeably odd was the extreme quiet of the planes under the circumstances. It seemed as though the aircraft were essentially in an idle mode, as they were at fairly low altitude and yet barely audible. Not characteristic of fighter aircraft flight, it would seem. The aircraft specifications include, however, high maneuverability at low speed and low altitude (less than 1000 ft.) as well as “loitering” capability, so all does appear to be fitting under the circumstances. Where this excursion into “exotic technology” leads is, of course, subject to speculation, intrigue and potential covert affairs where we are unlikely to learn the details that we seek. My speculation may certainly be no better than yours, and I claim no expertise in that matter. My primary motive here is to get the data on the record, let you see the photographs that have been fairly captured, and to give some specifics from the measurement point of view. 1) The “lights” are hardly just lights. The historic record and eyewitness accounts have, until now, only been able to justify that claim because of insufficiency in detail. 2) The lights are certainly not flares; you will have to do your own homework on that account or take a trip to Gila Bend and wait long enough to settle the question for yourself. I consider myself lucky with respect to timing for this observation, but suffice it to say I did spend a couple of weeks under that particular night sky before the camera came to life for you. 4) If we try to force a slightly conventional physical explanation into the issue, the closest that I can offer at this time would be on the likes of a “plasma” ball. Some of us may recall the attention given to the “foo fighters” of decades past. Either way, the source, means of creation, control of location, appearance, disappearance, and purpose would all have to be opening questions in the matter. Concentrated energy sources or weapon development might be another line of pursuit. 5) We know that there is internal structure and geometry to the energy source. This is probably the most remarkable characteristic as it does imply a level of intelligence in the matter. Until we can get into the innards and dissect the electrons in traditional western scientific fashion (or gain metaphysical insight from the Native Americans, as an alternative) we must remain in a state of frustrated ignorance in the matter. I do not expect a fund-raising campaign to get to the truth of the matter to be successful, but I will keep the dream alive. 6) Another tantalizing conjecture concerns the prospect that the energy source is an “external” monitoring device or system. Heaven knows that there are plenty of things to be curious about at our military facilities these days. Many years ago I was privileged to see an unusual video (I thank the individual that pulled me aside for those moments, I apologize that I can not give you proper credit) that showed evidence of such a device or system. In this case, the daylight “orb”, as it were, appeared to demonstrate the motive of sampling certain particulates that were deliberately introduced into the upper atmosphere via aircraft; my interpretation of it being a sensor is based upon certain hesitations in motion during the path of transit. Either way, I am certainly willing to take the notion seriously enough to hope that the fund-raising campaign for truth succeeds someday. And there you have it… another mystery for the world in the annals of scientific observation. I would hope that you will consider it “fair and balanced reporting”. My job has been done in letting you know that something unusual occurred, I bear witness to it, I have provided a modicum of evidence to that effect, and you now have another problem on your hands to solve. I will keep working on it myself. ADDENDUM: additional info provided by a reader, YouTube video at bottom. As a concerned member of and for humanity, I often study up on the LIE being perpetuated against us – chemtrails, UFOs, Hybrids, DUMBs, etc.. My reading has lead me to your excellent website and article (https://carnicominstitute.org/wp/exotic-technology-witnessed/) after finding a YouTube video on the Geo/Bio engineering through aerial spraying, which is extremely prevalent where I live, near San Francisco. After browsing your website, I immediately noticing something familiar in the exotic technology article. I have seen those lights before, from 30,000 feet aboard United Flight 380 from IAH to SFO, at 10:59 PM on February 11, 2016, the flight path of which is pictured in the attached JPG and well north of where your sighting took place. The photos on your website are precisely what I viewed. I had been asleep for about an hour or so when at 10:58 PM, I had a strong mental sensation to wake up and look out of my starboard window; a sensation that I knew, even before seeing anything, that I’d see something out the window. Sure enough, the very second I put my forehead against the clear plastic and looked down, there were 5 large, brilliant balls of light in a cluster-like spread, in various degrees of size and brightness, emanating light in a fairly rapid but fluid pulsating manner, almost as if they were communicating with one another. One in particular, the largest, was the most active. It/they were so bright, that it was evident they were above the ground, perhaps anywhere from 50 to 400 feet, given they were lighting up the desert floor, causing stark, visible shadows against the surrounding mountain terrain. It was clear they were not tied to any kind of structure or pipe, as their increasing and decreasing glowing moved back and forth between each of them, the light being cast on the terrain where the others had been previously showed no silhouettes, structures, vehicles or roads at all. It was very difficult to gauge the size or diameter of them from 30,000 feet but if I had to guess, the largest may have been 200 to 400 feet and the smallest, perhaps 50 – 100 feet. Some math of the camera used, the altitude and size of the light could probably figure it out. At the very moment I began to reach for my iPhone to take a video, the largest light fluidly extinguished itself, followed immediately by the others. Two of the smaller ones appeared in a different but nearby location, pulsed lightly back and forth a few times, as if whispering to each other, and then went out for good. The shape of these lights ranged from stark, hard circular shapes to that of what looked like organized flames within a ball-like structure, just as what you have pictured on your website. I did manage to capture one of the smaller orbs during its final pulse of light before all went dark. I’ve attached a video of it here at 400% magnification, which came off an iPhone 6s video camera. Are there any other sightings, photos or videos of these things? I’d love to find out what they are. Keep up the great work and write-ups. Love the site.